Ive done a few human size pieces that worked out pretty well. I’ll tell you how I did mine — maybe it will help. The first piece was a 1940s pin up for a local barber shop, and the owner wanted it as realistic as possible. 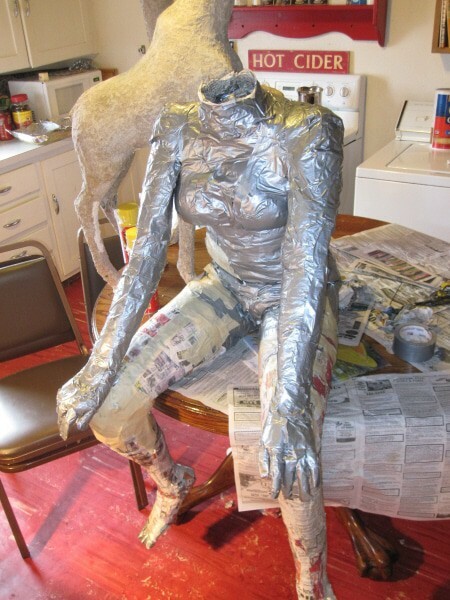 So after some research I decided to take duct tape and literally tape up my older daughter as an armature. 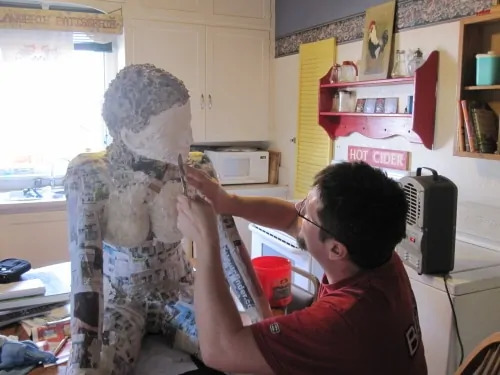 I didn’t want the sculpture any larger than her so I used paper towels (a single layer) under the few layers of duct tape. I did this in 3 steps, first the torso then the upper body and finally her head. Each time i cut the finished piece off of her in a straight line up her back so it came off like a suit. Then I taped the seam up with a single layer of duct tape. This gave me my skin. 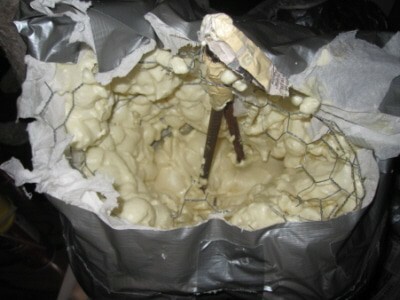 I then went to Home Depot and got some chicken wire, the smallest Rebar they had, and some simple window foam. I formed separate pieces roughly the size of all the body components, arms, legs chest etc. and placed them inside the body through the seam in the back. (The reason I taped it up in the first place was so that I could put the whole thing together and see how it looked. I use this seam for all insertions). The chicken wire doesn’t have to be exact, it just offers some extra strength around the Rebar and paper. Once I had the wire in (again roughly, I didn’t make perfectly shaped wire armatures), I then packed the body with crumpled paper in all the open spaces on the outside of the wire. After that I placed my Rebar inside the wire (it was already cut and bent into shape as the model was sitting) and packed more paper and some wire around the Rebar. After this it actually looked freakishly realistic, enough so that it scared people who walked into the room BUT the whole piece was kinda loosey goosy, so this is where the foam comes in. I was pretty liberal with the foam thing — it filled the small places like wrinkles and fingers etc… this sat for several days because when enclosed inside the tape it takes forever to dry. After it was done I finally had a good armature to lay my paper strips on. 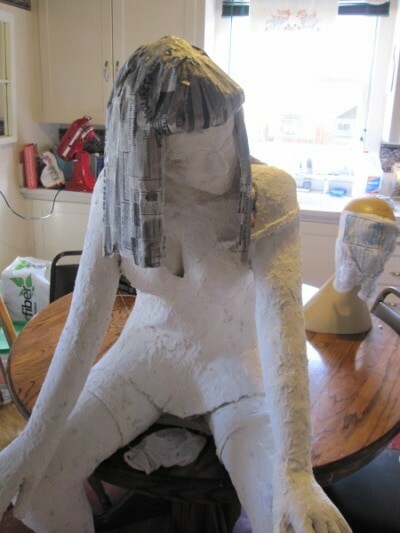 Then after that lots of Paper mache clay. (See Michael applying the clay in the photo at the top of this post). Hope this helps. This method is kind of reverse of how you do most pieces as I did the skin first. But it worked well and she’s got a home in a barber shop. Thanks Michael! 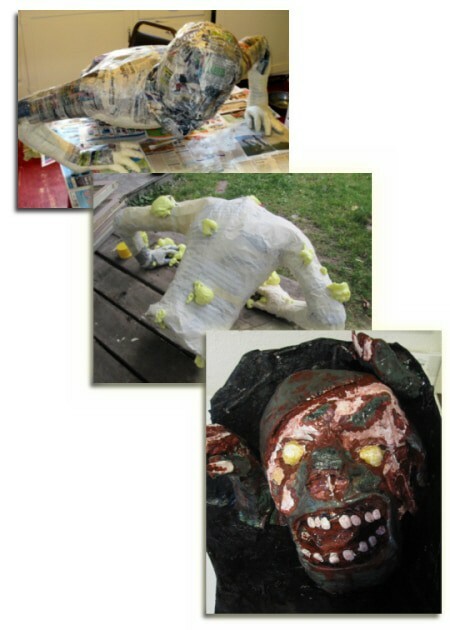 Here’s another figure , a zombie, that Michael made using the same methods. Hi Raché. Rebar is, I think, short for reinforcing bar. It’s used to reinforce concrete, so you can find it at any DIY store. It’s made out of iron, and it will rust, but it’s really strong. In fact, it isn’t easy to bend, but for a large sculpture it’s perfect for the ‘bones’ of an armature. Hi Sylvia. Your lizard image didn’t come through, probably because it was too big. We would love to see it (and your Neanderthal, when you find it) so please take a look a the photo editing tips at the top of this page and try again. I’m curious about how he did the hair. Do you have any resources about doing it? It looks like he rolled up some damp paper, and when it dried he covered it with paper mache. This is a really old post, and I doubt that the author is still watching it for comments. I have looked to see how the head was done but I must be missing the process, can someone please point me in the right direction? Thank you!